Over the years, several court rulings have clarified this clause to cover any public institution, such as publicly funded schools. The Supreme Court of the United States has affirmed lower court rulings that specifically state that the teaching of creationism in public schools violates the Establishment Clause. In McLean v. Arkansas, the judge ruled that creation science is not science because it depends on a supernatural intervention; in Edwards v. Aguillard, the Supreme Court affirmed a ruling that a Louisiana law requiring the teaching of “creation science” was unconstitutional because it advanced a particular religious viewpoint; and in Kitzmiller v. Dover, a district court judge ruled that Intelligent design was another form of creationism (read that as religion). It is ironic (or just plain cynical) that the same individuals who profess that there is some magical quality in the US Constitution are also the first to push laws that are in clear violation of one of the most basic tenets of that same constitution. Update from Missouri | NCSE. The chief sponsor of this bill says the “jury is still out on evolution.” Uh, what jury is that? The one in Kitzmiller v. Dover, where a Federal Judge ruled that Intelligent Design is not science? Or the scientific community that say’s evolution is basically a fact? 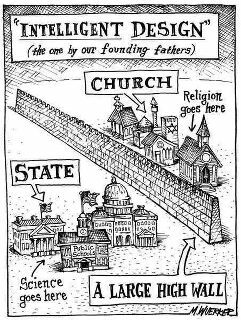 Or that intelligent design was “designed” to circumvent the Establishment Clause of the First Amendment to the US Constitution. So, Intelligent Design is a religious doctrine. The State of Missouri (well, at least some do) want to have that religious doctrine taught in public schools (run and funded by the State of Missouri). Sounds like they might have a legal challenge ahead. A second antievolution bill in Missouri | NCSE. Right after I pushed the “publish” button, I saw a second news article about Missouri. Apparently, there’s nothing really important going on in Missouri, so they decided to write two bills to add religious teaching in schools of Missouri. This is sad, because Missouri is one of the top states in the USA for science education. “Intelligent design” bill in Missouri | NCSE. Teaching intelligent design in public school biology classes violates the Establishment Clause of the First Amendment to the Constitution of the United States (and Article I, Section 3 of the Pennsylvania State Constitution) because intelligent design is not science and “cannot uncouple itself from its creationist, and thus religious, antecedents. It cost the Dover Area School District over $1 million to defend this lawsuit, money that probably could have been spent on textbooks, teachers, and new computers. I believe in the aftermath, all school board members who supported the teaching of Intelligent design were ousted by voters. That’s how democracy I suppose. If scientific theory concerning biological origin is taught in a course of study, biological evolution and biological intelligent design shall be taught. Other scientific theory or theories of origin may be taught. Just a tiny point, and I can’t expect much out of Missouri’s legislators, but the theory of evolution does not discuss the origin of life. The theory of abiogenesis does, and that’s more chemistry and physics than biologists. Biological evolution, or modern evolutionary synthesis, is based on a mountain of evidence. The theory isn’t used in the sense of a random guess, but a scientific one with a foundation in scientific method and piles of evidence. It is falsifiable (but has not been falsified) and has itself evolved into a power predictor of how populations of organisms change over time. Intelligent design is not falsifiable (in that it requires an all powerful creator) and is not scientific. It is based on no evidence, just ideology and rhetoric. It fails as science once the bright light of criticism is shone on it. Well, I don’t know how Missouri’s legislature is organized, but I hope they’re intelligent enough not to do this. But if they do, expect several lawsuits. And they’ll lose them all.